Commuters face thick fog on San Diego roadways on Friday morning. The dense, patchy fog blanketing the San Diego County coastline early Friday may slow down the morning commute and cause delays at Lindbergh Field. A National Weather Service dense fog advisory for the coastal areas into the mesas is in effect until 9 a.m. The advisory applies to the cities of Carlsbad, Chula Vista, Encinitas, National City, San Diego and Vista. The fog may cause visibility to drop to a quarter-mile or less at times, which could lead to hazardous driving conditions on Interstate 5, 8 and 805, state Route 163 and surface streets in the area, according to the weather service. The lowest visibility is expected near higher coastal terrain. Drivers were urged to slow down, use their low beam headlights and stay well back from vehicles ahead of them. Forecasters said early morning delays may also be possible at Lindbergh Field. 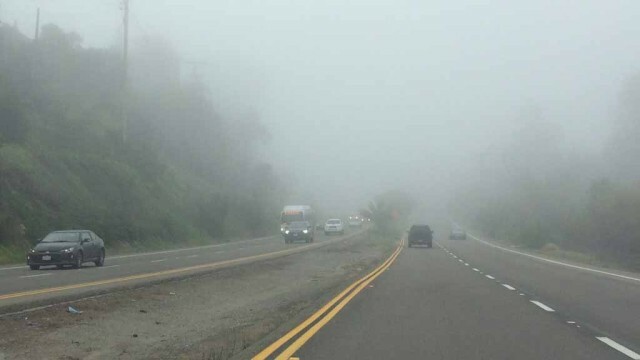 The fog will likely redevelop from the coast into the valleys each night through Monday, according to the weather service.